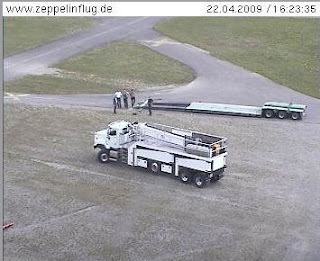 Airship Ventures: When does a truck need another truck? 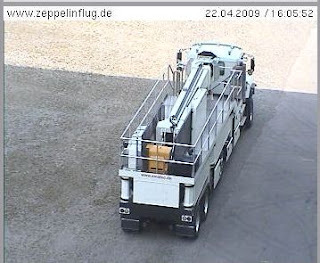 Glenn Adams sent us these webcam snaps of our mast truck being loaded for transport. 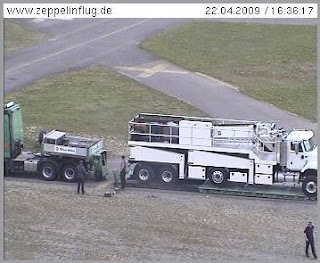 Just as the German trucks were not automatically allowed on US roads when we first brought them in (they are fine now), our US spec truck has the reverse issue in Germany! 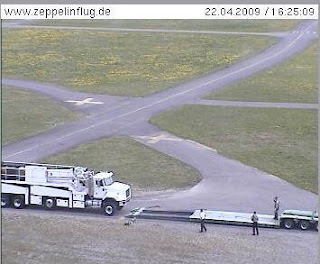 The German trucks are not quite as long, and have a better turning circle -- crucial for navigating traffic circles (kreisverkehr) and other tight spots on European roads, among other things. Our truck is longer, with a mid-mounted drop-axle, to better distribute weight -- a requirement for operating on highways here in the US.